Cellular nutrition is vitally important to the human body, and is the key component that maintains the whole system. The trillion cells that are the building blocks of the human body, need vital nutrients to maintain longevity, good health, and wellness. Nutrition and health issues are now taking center stage, due to the fact that a lot of attention are now been given to this subject., also, great emphasis is now being placed on it. One of the reasons these two factors are being highlighted is the fact that more and more people are searching for ways and means to improve their health, due to the fact that people from around the world are being plagued various diseases. This awareness can be attributed to the availability of educational health resources which is absolutely free, and also in conjunction to easy access. First, We must learn what cells are, what purpose they serve, and how they function. Cells are the central units and building blocks, in essence they are the foundation on which the whole system operates and functions. People around the world have been experiencing wide spread epidemic of obesity as a result of under-nutrition which has escalated exponentially, resulting in cardiovascular problems also known as heart attacks which is now said to be the number one killer. The lack or absence of cellular nutrition is one of the key factors that has contributed and exposed millions of people to the risk of developing heart attack due to high fat diets, fast foods, and snacks low in protein. Is it possible to reduce this risk? The answer is absolutely yes, through health education and its application, by implementing and following a good health nutrition for wellness diet plan, taking healthy shakes, high protein snacks, fruits, vegetables and healthy meals. Specifically, I have carefully selected and incorporated lesson 1 through lesson 4 videos as an integral and core aspect of this text, focusing on nutrition education that explain in great details, and augment the important and vital roles that nutrition plays in supporting and nurturing the trillion cells that enable them to carrying out their functions throughout the entire body. After listening to these free educational videos, the objective is, you will have gained a wide wealth of health education knowledge that will undoubtedly help you to curve and change your whole approach to health and wellness by: the way you eat, what you eat, and how you eat. In essence, you are now provided with the tools to assist and point you in the right direction to take your health to another level, and you will be glad you did take the time out to explore it, because everyone wants to have good health, but not everyone is willing to make the sacrifice and change to achieve it. However, the fact is it's an individual process that is not transferable. It is said that "Health is a Man's greatest assets" and not having good health becomes a stumbling block and impediment in your life preventing you from achieving any form of success. You can prolong your life by educating yourself listening to this free educational video presentation on cellular nutrition. Your health is your greatest asset and without good health you will not be able to function effectively. Even the type of dessert you eat can affect your health especially if you are diabetic. However, you can have healthy dessert without the added sugar, dairy fat, and those calories by using the Dessert Bullet. The combination of the NutriBullet, Dessert Bullet, and the Nutrition shakes which comes in different flavor, provides you the tools to change the way you eat, also your diet to obtain optimum health, based on the fact that good diet plays a vital role as an integral part in treating diabetes. A lot of attention and focus are now being drawn to cellular nutrition, and one of the main factors that is responsible for this awareness is the wealth of resources that are now being widely distributed and made available relating to this topic that has taken center stage and now coming to the fore front. People around the world in many countries are gravitating and beginning to glean and learn more on "how cellular nutrition is the key element" that promotes and contributes to their ultimate health and wellness. You now hear many medical practitioners nowadays testify by saying that even though they have gone through medical school, they still did not pay much attention and emphasis on nutrition that specifically target the cells. The big question is why? Listen Dr. Doctor Herber as he explains in a very timely manner the importance of cellular nutrition how it impacts your life in a favorable way, and how it can work for you. Every single organ of the body is made up of cells. For these cells to function effectively, the proper nutrition must get to all these cells. Cellular nutrition targets and provides all the cells in your body with the proper nutrition that is needed each day. It is said that when it comes to health and nutrition, "only a small percentage of people who think about the cells." The cells contain the sources of the body's energy supply. The cells are what allows you to function at optimal health in general. You Need To Know How The Cells Function in Your Body to prolong your life and ingrease longevity. The body needs fuel to create energy that is needed to function through the day. This energy comes from the cells through cellular nutrition that specifically target the cells. Protein is extremely important and is basically the main ingredients in your diet because it helps to build and maintain healthy muscles in your body. Also protein plays a vital role by maintaining healthy organs. It is imperative to get enough protein in your diet to prevent your body from taking protein from your liver, muscles and the other organs. Instead you can purchase your protein shake here. In essence, you need enough protein to energize and nurture the cells that are the tiniest living units in your body that provide the energy that propels the body through the day. Here are the sequential steps and order how the nutrition that is taken in the body provides the energy. As these are nurtured, they grow, repair themselves and are able to function at their maximum capacities. It helps the whole body to feel better, look better, and also enable the body to fight against diseases that infiltrate it. Now we know that the cells are the building blocks upon which the human body is built, operates, and functions, it's important to pay keen attention to cellular nutrition to keep these cells healthy and functional. If you are interested of which I believe you are in improving your health, then it is of vital important that you listen to the following videos that further explain and provide you with the nutrition education you need to maintain a balance healthy lifestyle. A great source of protein can be found in "Cellular Nutrition Shakes" that can be purchased from Amazon.com. It is said that "learning only takes place when their is a change in behavior." 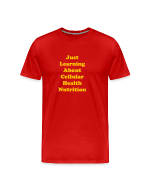 The resources provide the Nutrition Education that will help you to change your behavior through the learning process they provide absolutely free. You can change your behavior starting right now through the use of this free education that will also help you to achieve ultimate health and wellness through healthy eating and proper dieting.